The production launch of the 2013 SRT Viper is getting very close and today, the Chrysler Group offered up more information (and new pictures) of their new supercar including an incredible top speed of 206 miles per hour – making the 2013 Viper the fastest normal production car from an American automaker, ever. There was a full complement of information introduced today by the Chrysler Group about the 2013 SRT Viper but the most important piece of information was the 206 mile per hour top speed. That allows the new Viper to edge out the Chevrolet Corvette ZR1 by one mile per hour – making the 2013 Viper the fastest American production car of all time. Some other notables in the 200mph+ club right now are the 2013 Ford Shelby GT500 (202), the Lamborghini Gallardo LP 570-4 Superleggera (202) and the McLaren MP4-12C (205) with only the Ferrari FF (208), the Ferrari F12 Berlinetta (211), the Lamborghini Aventador LP700 (217) and the Bugatti Veyron Super Sport (268) ranking higher than the new Viper in terms of top speed. We should note that those four cars that have a higher top speed than the 2013 Viper carry price tags of $295,000, $343,385, $376,000 and $2.4 million respectively while the Viper starts around $97,000 so not only is it one of the fastest cars in the world AND one of the fastest American cars of all time – it is also quite a bit less expensive than comparable supercars. The Viper has always been considered one of the most impressive supercars in the world in terms of handling performance but the new snake now packs a top speed to fend off the best cars in the world. Some other important figures that will help make the 2013 SRT Viper one of the most significant performance cars in American history include more figures that can be attributed to the lightweight design coupled with the 640 horsepower V10 engine. Chrysler hasn’t released exact figures for these categories but the company has promised 0-60 times in the low 3 second range, a quarter mile time in the mid 11 second range and the ability to move from a stop, to 100 miles per hour and back to a stop in less than 12 seconds. The one figure that is likely to draw criticism from those who like to downplay American supercars is the expected 60-0 braking distance of the 2013 SRT Viper. 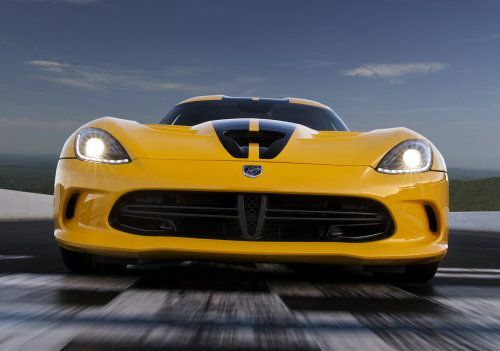 Chrysler expects that the new Viper will get to a dead stop from 60 miles per hour in just 106 feet. That is certainly a stopping distance that will bring about some heavy g forces while outperforming most of the cars in the world but that distance is 9 feet longer than the 97 feet required for the old Dodge Viper SRT10 to get from 60 to nil. The Corvette ZR1 gets stopped in 97 feet as well while the Corvette Carbon Edition is among the quickest stoppers in the world with a 60-0 distance of just 93 feet. While these figures are all important in the supercar world, the true test of the 2013 SRT Viper and the new Viper GTS will come when Chrysler gets their new supercars onto the 12.9 mile German road course known as the Green Hell. The Nürburgring Nordschleife has become the main gauge of just how good a performance car really is and with the 2010 Dodge Viper SRT10 ACR holding the current production car record around the famed European race track, the 2013 SRT Viper has some mighty big shoes to fill. Considering that the 2013 Viper has a refined lightweight body, a redesigned chassis architecture, more power and a high tech adjustable suspension setup, the new Viper GTS stands a very real chance of going to the Nürburgring and showing that when it comes to overall supercar performance – the Viper is the best supercar in the US and maybe even the world. In addition to the performance figures announced today, the Chrysler Group issued over a hundred new shots of the 2013 SRT Viper both in base and GTS form including underhood and interior shots. You can click here to check out over 200 official high resolution images of the 2013 Viper on the TorqueNews.com Facebook page and don't forget to "like" the page while you're there!